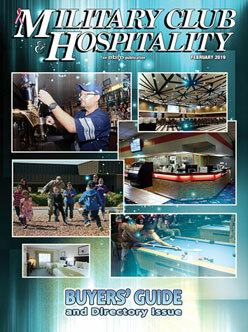 Welcome to Military Club & Hospitality (MCH) on the Web!! The articles online are highlights of the most recent Military Club & Hospitality. Click here for a subscription. Click here to see current advertising rates in pdf format. Click here for 2019 Editorial Calendar in pdf format. Click here for June 2018 Circulation Statement in pdf format. MECHANICAL INFORMATION: Issued 6 times a year. Web offset printed on glossy coated stock. Type pages 7" wide x 10" deep. Trim size - 8-1/8" x 10-7/8". Gutter width 3/8" each side. Two or Three-column format. Columns are 2-1/4" wide (3 column format) by 10" deep. Columns are 3-3/8" wide (2 column format) by 10" deep. NON-BLEED SPREADS: Bleed across gutter only. 1" center safety, including gutter. Full page spread. 14-3/4" x 10" (each page 7-3/8" x 10"). Horizontal half page spread. 14-3/4" x 4-7/8" (each page 7-3/8" x 4-7/8"). BLEED SIZES: Keep all matter not bleeding 3/8" from trim edges. Full page. Bleeds gutter and three sides. Bleed size, 8-3/8" x 11-1/8". Trim size, 8-1/8" x 10-7/8". Full page spread. Bleeds all sides and gutter. Bleed size, 16-3/4" x 11-1/8". Trim size, 16-1/4" x 10-7/8" (each page, 8-1/8" x 10-7/8"). Horizontal half-page spread. Bleeds bottom, two sides and gutter. Bleed size, 16-3/4" x 5-1/2". Trim size, 16-1/4" x 5-3/8" (each page, 8-1/8" x 5-3/8"). Published first week of month. Advertising space reservations close 5 weeks prior to publication, except convention issues and almanac, eight weeks prior. All material due 5 weeks prior to publication. • Electronic files required for all advertisements — four-color, spot color, and black-and-white. Press-ready PDF files are preferred; TIF and EPS files are also acceptable. Check with publisher before sending an ad in any other format. Word-processing (Word, WordPerfect, etc.) and presentation programs (e.g., Powerpoint) are not accepted for finished ads. • All photos must be 266-300 dpi resolution at 100% of size used in ad. They should be formatted using CYMK for four-color or as grayscale for black and white and placed in the document. Fonts should be embedded or changed to art so no copy reflow or font replacement occurs. TrueType fonts are not accepted. • No hard-copy proof is required if a PDF is furnished. For critical color reproduction, advertiser is responsible for furnishing color proof. Otherwise, furnished pdf will be used on press for color. • Color rotation (web offset): Black, Cyan, Magenta, Yellow using IPI inks. • CDs, DVDs and other media are accepted. E-mailed files under 5mb accepted: e-mail to janet@productionebm.com. To upload files to the Military Club & Hospitality FTP site, contact production director. Material received that does not meet our requirements will need additional work. All additional work will be billed to the advertiser. The minimum charge is $50.00. A written production cost sheet will be furnished upon receipt of advertising material. As an additional service to our advertisers, design, layout and production expertise is available. We can start with copy and photos or work with your electronic file. Call the Production department for more information. Inserts accepted for binding or tip-in. Gatefolds available with two-month lead time. Contact us for rates, mechanical specifications and shipping instructions. Color rotation (web offset): blue, black, red, yellow using IPI inks. Advertising materials retained for 12 months, then discarded unless other instructions are received from advertiser or agency. For answers to questions regarding material or material due dates, please call the production department at 516-334-3030 or fax us at 516-334-8958. Contracts and insertion orders should be sent to Military Club & Hospitality, 825 Old Country Road, Westbury, NY 11590-0812. Copy, artwork, and other printing material (except inserts) should be sent to the attention of the Production Department. For U.S. and APO/FPO/DPO addresses, one year, $30; two years, $55; single copies, $6.00 plus postage except August Market Guide, $25.